The newest version of most Android apps published by Google have started featuring "cards." Many other popular apps are also following suit... After reading this tutorial you will be able to create cards as well. It really is very simple. 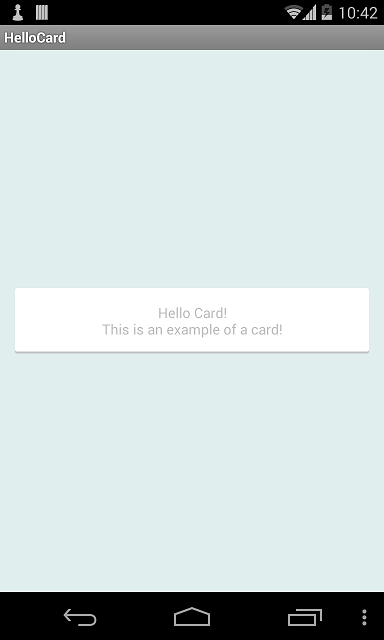 A card is nothing more than a layout or a view with a background drawable. And that drawable can be defined in XML as a layer drawable. If you don't want to have a pressed state for the cards in the list then you can skip this step. Otherwise, create a new drawable file called layer_card_background_pressed.xml. It should be a duplicate of layer_card_background.xml but the main color defined in the second item should be changed to a different color for the pressed state. 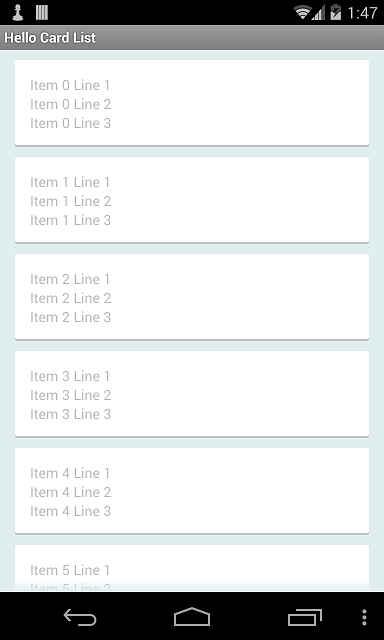 Next you need to create a selector resource that will be used as the background for the card items. Now all you have to do is get your adapter to inflate the items with the above layout. You can modify anything inside the LinearLayout... You can even change the LinearLayout to a different kind of layout if you need to. Just don't change any of the attributes on the FrameLayout other than the padding or item clicks may not work right. For information on a really cool way to prevent writing lots of adapters check our my last post. If you want the entire source used for this post you can download this IntelliJ Project.